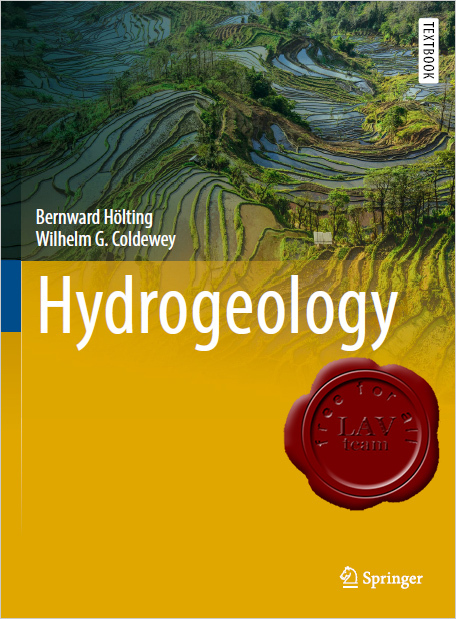 This hydrogeology book is the English translation of the German textbook "Hydrogeologie” by Hölting and Coldewey. Published since 1980, this book is in its eighth edition. Its great success is attributed to the concept of the book. It was important for the authors to write a text that is generally easy to understand, both for experts and for persons who do not work in this special field. Consistent use of the internationally accepted SI units as well as the formula symbols in the text also contribute to the comprehensibility. All technical terms and their definitions match the various standards and are used consistently. Moreover, the original literature citations were completely revised in order to avoid misunderstandings and errors due to secondary sources. All of these points improve the readability and facilitate the understanding of the relatively complex concepts of general and applied hydrogeology. Because this textbook is translated from the German edition, many of the hydrogeological examples depict the Central European region. Even though they have general relevance, knowledge of the local situation is not required. 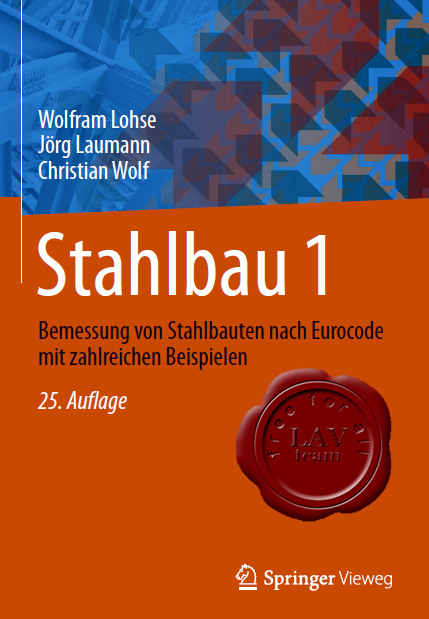 Furthermore, the book cites laws and regulations of the Federal Republic of Germany and the European Union (EU), whose meaning and handling are certainly also interesting for readers from other countries. May this book promote understanding of the complex material of hydrogeology as well as the correlations between the fields of geology, hydrochemistry, geohydraulics and engineering for a wide international public and contribute to solving global problems with groundwater development, exploitation, and protection. 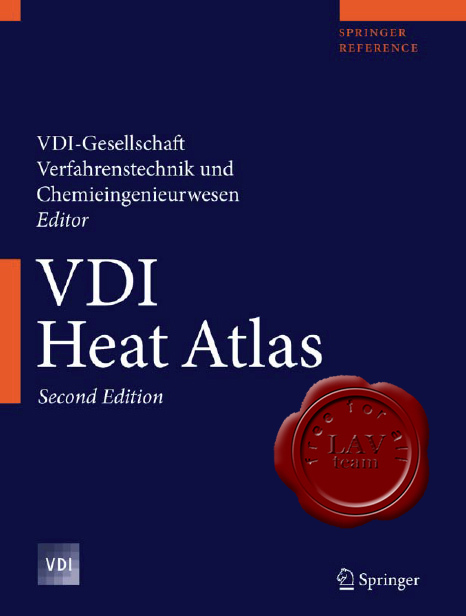 The VDI-Warmeatlas or VDI Heat Atlas has a long-lasting history and it can be considered as a standard book for heat exchanger and process engineering equipment design. It is not conceived as a textbook presenting an overall view of the theoretical or experimental findings in heat transfer sciences. The aim was and is to present and explain the state of the art of engineering methods to solve industrially relevant heat transfer problems for apparatus design and process modeling. The first German edition was published in 1963. The sixth German edition was translated into English to meet the demands of the more and more internationally acting industry. This first English edition was published in 1992. Since then, the German edition was regularly updated until the tenth edition published in 2006. In view of today’s globally acting industry, the editorial board felt the necessity to revise the English edition in order to account for the most recent state of our knowledge. Instead of only translating the latest German edition, we preferred restructuring it at the same time because this also enabled us to include new subjects and to update methods according to the recent state of the art. This new structure will also serve as a basis for the forthcoming German edition. On behalf of the editorial board, I express my sincere thanks to the authors of the various sections for their contributions and kind cooperation. The editorial work was coordinated and assisted by Mrs. Sigrid Cuneus from Springer-Verlag, Berlin. We are indebted to her for the efficient work and pleasant collaboration. We are also grateful to Mrs. Tina Shelton from the Reference and Database Publishing group, Springer Reference Editorial, India, who handled the editorial workflow. 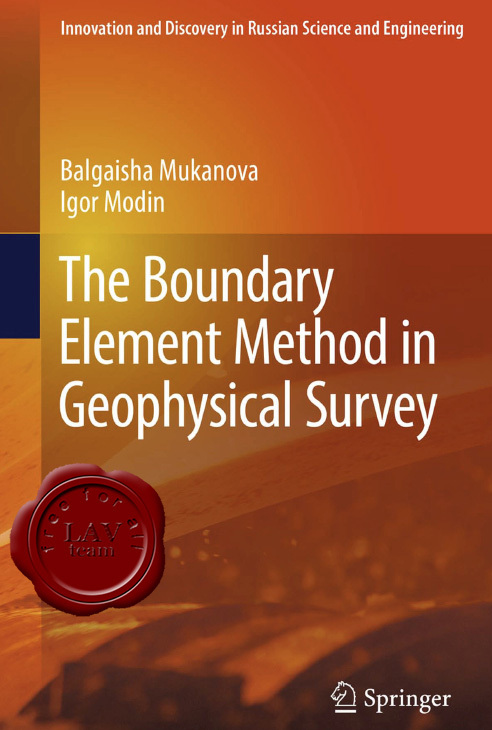 This volume is devoted to the application of the integral equations method (IEM) and boundary elements method (BEM) to problems involving the sounding of geological media using direct current (DC). Adaptive mesh generation algorithms and numerical methods for solving a system of integral equations are discussed. Integral equations for the media, which contains piecewise linear contact boundaries, immersed local inclusions, and subsurface relief, are derived and solved numerically. Describes in detail the application of the BEM and IEM to 2.5D direct problems using ERT for geological media with a complex structure and having a large number of internal contact boundaries. Provides algorithms of grid generation of the boundaries that are adapted to the geometry of the media, the surface relief and the measurements of electrode arrays. Discusses the application of the BEM to 3D sounding problems using the ERT method. Illustrates the applications of inversion programs to synthetic data generated using the BEM in comparison with the original model and discusses the quality of the associated interpretation. 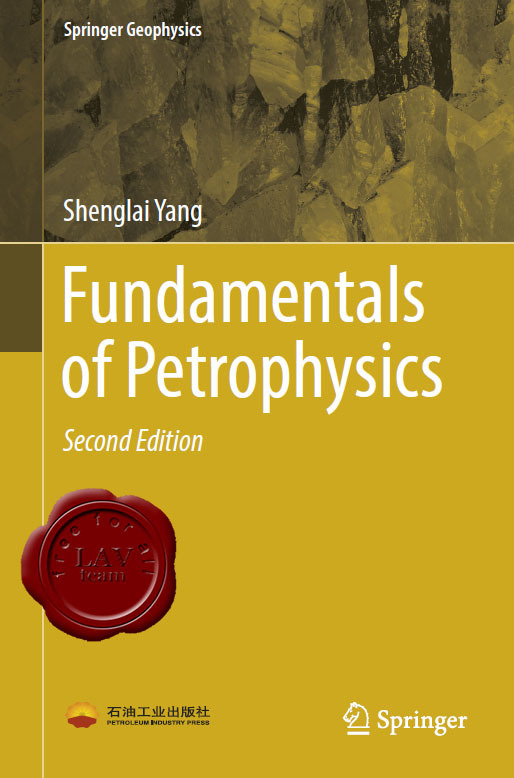 This book presents fundamental physical and physicochemical knowledge involved in oil and gas development engineering, such as physical and chemical phenomena, physical process. It is arranged to provide the knowledge of porous rock properties of reservoir rocks, and properties of fluids, i.e., gases, hydrocarbon liquids, and aqueous solutions, and the mechanism of multiphase fluid flow in porous media. The book also brings together the application of the above theories and knowledge. This textbook is written to serve the undergraduate teaching of the petroleum engineering major. It focuses on the introduction of basic conceptions, terms, definitions, and theories, placing more emphasis on the width of knowledge rather than the depth. What should be learned through the course includes the definitions of some essential physical parameters, the physical process, important physical phenomena, influencing factors, and engineering applications. In addition, the measuring methods and experimental procedures for the key parameters are also included. Through the study of this book, good foundation of knowledge frame for petroleum engineering should be established for students, which is benefit for both their further studying and their work in the future when they are engaged in job. Mineral resource estimation has changed considerably in the past 25 years: geostatistical techniques have become commonplace and continue to evolve; computational horsepower has revolutionized all facets of numerical modeling; mining and processing operations are often larger; and uncertainty quantification is becoming standard practice. Recent books focus on historical methods or details of geostatistical theory. 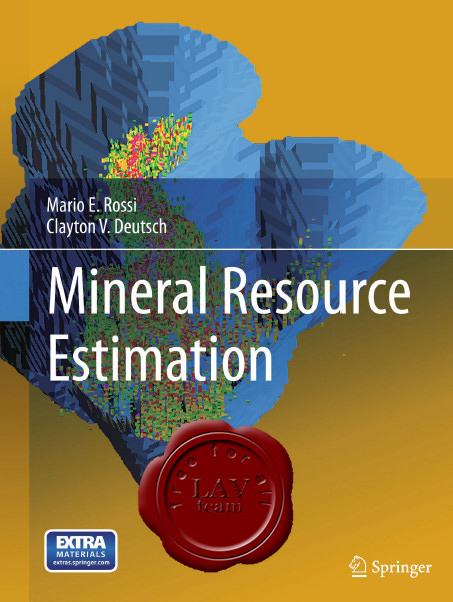 So there is a growing need to collect and synthesize the practice of modern mineral resource estimation into a book for undergraduate students, beginning graduate students, and young geologists and engineers. It is especially fruitful that this book is written by authors with years of relevant experience performing mineral resource estimation and with years of relevant teaching experience. This comprehensive textbook and reference fills this need.